Eristavi are the great feudal lords of Georgia. Each rules a saeristavo, an administrative division in the Georgian kingdom, under the appointment of the king. 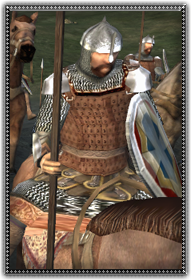 When called to war by the Georgian king, the Eristavi must deploy its guard to join their sovereign's army as heavy cavalry encased in thick armor and armed with lance and sword. The Eristav’s cavalry lancers are trained veterans of war and are ready to protect their lord against the enemies the fatherland... and sometimes against the king himself to render service to the political ambitions of their Eristav. Eristavi Cavalry wear heavy armor and are well trained veterans of war.